Harvested Sweet Potato-Watch my Harvest Video Below! Sweet potatoes are chalk full of nutrients and easier to grow then you think. This my second year growing them. The prior year, I grew then in raised vegetable beds and had a so-so turnout. The potatoes were skinny and I reasoned that my growing season wasn’t long or hot enough. How come? These taters like it hot. So, choose wisely for your climate. A prior year, I chose a northern variety sampler from Sands Hills Preservation Center. 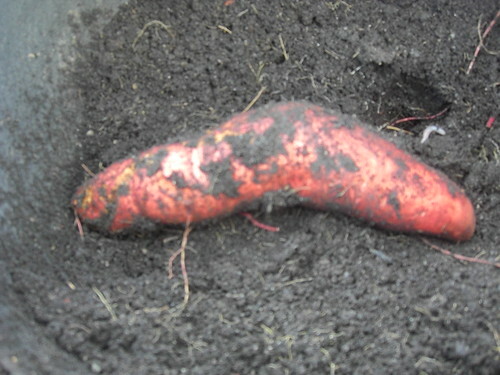 Unlike, potatoes, sweet potatoes grow from slips, which resembles seedlings coming out of the potatoes. I have tried growing my own slips but for some reason, I can’t. For those who want to try their hand at growing their own sips, see here for the instructions. The window sill method did not work for me. I tired it twice and failed. Next time, I will try the greenhouse method. Have you grown your own slips? As I mentioned above, I bought my original slips at Sands Hills but the last couple of years, their supply has been unreliable due to weather. This year after failing to grow my own slips, I purchased ones from Steele Plant Company. The minimum order is 12 slips. If this is too many slips, see if you can share an order with someone. Which sweet potato slips did I order? Beauregard sweet potatoes. However, Steele offers other varieties. In the north, it is really important that you prepare your beds so the soil is nice and warm. The first year, I planted at the end of June and used plastic trash bags to keep the soil warm. Many people buy plastic mulch to keep the soil warm. This year, I decided to use potato bags since they are black and would keep the soil nice and warm. (You know, I love these bags and have grown potatoes in them for a couple of years.) I also like the idea of not losing a few beds to the taters since the slips should be planted 12 inches apart in rows 3 feet wide. The vines are enormous. I prepared the bags early with half compost and half garden soil. Then, I cover the tops of the bags with black fabric to keep the soil warm. My slips showed up in the middle of June. I was nervous that I was planting the slips too early. 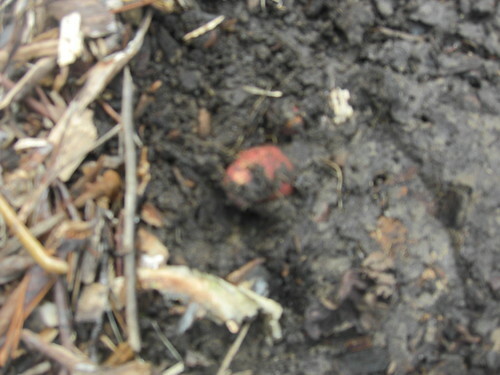 What happens if the soil is too cool? Will the plants die? Unlike beds, no mounding is required. Simply take a pencil and make a hole. Then slide the slip right in. Give your new baby a drink of water and cover up the soil with black fabric or plastic mulch. Now, sit back and wait for the vines to grow. For awhile, our summer weather was not cooperating and I started to worry. Then, bam! Hot weather and the taters took off and never look back. And boy, can those vines grow. I always harvest right before a frost is coming. My frost date is October 15. Beaureguard sweet potatoes mature in 90-110 days so I was right in line with the maturity time frame. Someone told me once you see the flowers, which look like trumpet flowers, a month later, you should harvest the potatoes. Some of the potatoes were so big it was like extracting a tooth out of someone’s mouth. The length of the middle potato pictured above was about 12 inches. Some of the potatoes grow under the bag as well. You got me on how this happened. At the same time, I planted one slip in the soil near my sorghum. The taters were definitively easier to harvest but significantly smaller. B. The black bags which kept the soil warm? C. They liked being snug? “Cure sweet potatoes by holding them for about 10 days at 80-85°F and high relative humidity (85-90 percent). In the absence of better facilities, they can be cured near a furnace to provide warmth. If the temperature near your furnace is between 65-75°F, the curing period should last 2-3 weeks. To maintain the required high humidity (85-90 percent relative humidity), stack storage crates or boxes and cover them with paper or heavy cloth. Packing in perforated plastic bags will also keep humidity high, yet the perforations will allow excess moisture to escape. This time, I cured them on my oven grates on my counter. The temperature in my house hovers around 70 degrees. I will be moving them to a cooler area now that they have cured. Boy, I can’t wait to make my first sweet potato! 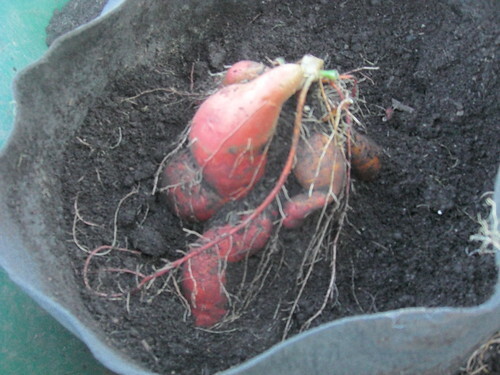 Do you grow sweet potatoes? Any tips? Have a favorite sweet potato recipe. Please share the recipe link in the comments. Do you use potato bags for growing your vegetables? Disclaimer: I am an affiliate of Gardener’s Supply because I love their products especially their potato bags! Every purchase you make from Gardener’s Supply helps Green Talk to pump out great content! Give that gardener something special for the holidays or his or her birthday. Did you know that you can eat the sweet potato leaves, too? They are frequently used in Asian cuisine like stir fries. If you take too many, it affects the size of the sweet potato, though. I love sweet potatoes….for snacks I just boil them. When it’s time to eat, we just peel them, put a little butter or margarine and a little sugar. To harvest without bruising turn the bag over onto plastic or a wheel barrel then pick out the potatoes.